The Great Cowley Duck Dash! Thank you to everyone who joined us for the 21st Annual Duck Dash Scholarship Fundraiser at W.S. Scott Auditorium on May 19, 2018. Please click here to read about this event! 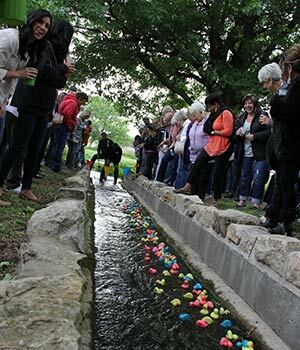 Where can you race hundreds of little plastic ducks down a spring-fed stream in one of the most beautiful landscapes on the Flinthills, while at the same time raising money for college scholarships? The Great Cowley Duck Dash! Hosted on the grounds of the beautiful Spring Hill Farms in rural Cowley County, the Great Cowley Duck Dash is the social event of the county. Each year this invitation-only event allows our donors to gather together with friends, enjoy a gourmet prime-rib meal and raise thousands of dollars in support of Foundation scholarships. We are blessed to have over 60 sponsors for the event to help cover the cost of hosting the event. Attendees purchase tickets allowing them to race ducks down the stream for a chance to win $1,000 in prize money! It’s a wonderful, fun-filled evening complete with door-prizes, delicious food and friendly faces!